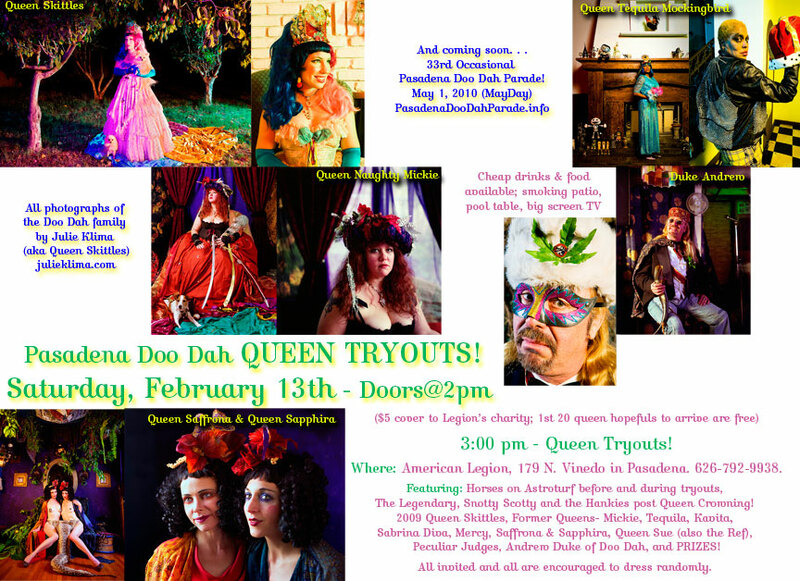 Doo Dah QUEEN TRYOUTS! Feb 13th! I did all the photos as part of my Doo Dah Parade Queen & Family Portraits. On my website, you can also view the spread I had in this year’s Rose Parade Magazine, which included my Doo Dah Parade portraits – Rose Parade Magazine Spread. I am also a newly ordained minister- for the specially wonderful occasion of the marriage between Kerri & Richard, who had their first date at The Parade last year. I was so honored when they contacted me & asked me to perform the ceremony! So Queen Skittles not only does wedding photography, I now can also be the wedding officiant (compliments of a website many people go to – themonastary.org. It still counts legally according to the Los Angeles County clerk!). In other news, I just rehauled & updated my website! Check it out – www.JulieKlima.com – New & Improved! So many exclamation points in this email. If I have more news later, I will report it to you faster than I have been. In any case, ta ta for now. . .
You are currently browsing the Queen Skittles of the 2009 Pasadena DooDah Parade blog archives for February, 2010.